church, and the Bible. After each, please pause and reflect on the answer. 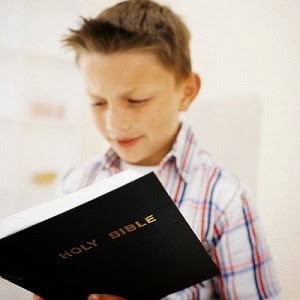 Do your children bring their Bibles to church? Do your children USE their Bibles at church? Are Bibles needed by your children during your programs? Do you have Bibles available for children who don’t bring or have one? Are there a bunch of battered, torn, and coverless Bibles laying around your church? When is the last time you saw a child reading their Bible on their own? When is the last time you saw a child reading the Bible? Do your lower elementary children know the books of the Bible by memory? Can your upper elementary children look up a Bible verse without help or the table of contents? Do you have any children who have marked up, underlined and well worn (from use) Bibles? Are your lessons birthed out of the Word, or out of a box or disc? If all Bibles in America were banned and confiscated, but any electronic version or use was still allowed, would there be any noticeable change in your lessons and/or program? Do you have a marked up, underlined and well worn (from use) Bible? These questions are meant to stimulate thought, not guilt – though my asking gives away a serious concern I have with what I would call the growing Bibleless Trend in Children’s Ministry. I travel to many churches as a guest speaker or trainer and am very often stunned by how little need there is for Bibles in most children’s ministries. I consider teaching with and out of a Bible to be the FUNDAMENTAL BASIS of my teaching. I use puppets, object lessons, media clips, illusions and you-name-it, I’ve used it, to creatively teach and engage children, but never as a replacement or substitute for teaching with and out of a Bible. ONLY THE BIBLE HAS GOD’S PROMISE OF EFFECTIVENESS. And yet, the Bible is a rare object in perhaps most children’s ministries today. This is a tragedy! I have seen churches where none of the kids had Bibles, and when I tried to find some to pass out, or at least to use with 5-6 kids on stage for a Sword Drill – NONE COULD BE FOUND to use. Not in the well-equipped resource room, not in the library PACKED with books ABOUT the Bible, not even battered shameful looking Bibles on shelves in the back of the room. And this has happened over and over in churches around America. I don’t care how attractive your ministry facility is, how innovative your program, how creative your teaching – if you are neglecting to teach kids the value of God’s Word by example (teaching with and from it) you ARE TEACHING THEM A LESSON: that the Bible really isn’t that important. Kids learn by what they SEE – they need to see you teaching with and from an ACTUAL Bible. And the learn by what they DO – reading in and from an ACTUAL Bible. If the only Bible they see are PowerPoint slides and cartoon re-enactments it is no wonder when they outgrow children’s ministry they outgrow the Bible too. The best way to get God into the hearts of kids, is to get His Word into their hearts! If you truly wants God power in your teaching – don’t just quote His Word – USE His Word! We live in a day and age when there is no end to the new and innovative resources for children’s ministry (and that’s a good thing!) but it may just be the next best thing for your children’s ministry is to return to an emphasis on the Word of God – in practice – not just in word.